The teaching materials for the learning experience on “The Plan of Salvation” are divided into three parts. In part 1, students will study paragraphs 2.1 through 2.19 of this doctrinal topic using the information in the Doctrinal Mastery Core Document. They will learn about the Savior’s central role in the plan of salvation. They will also study the doctrinal mastery passage Doctrine and Covenants 76:22–24. Note: You could teach the segments of this lesson in a single class session or over the course of several class sessions. If you choose to teach the “Understanding the Doctrine” segments over the course of several class sessions, you may need to briefly review with students what they learned in previous segments before you teach a new segment. Draw the line and the triangle of the accompanying diagram on the board (without any of the words). Explain that the straight line represents a board and the triangle represents the point of balance. Draw various shapes at different points on the line to represent objects being placed on the board. Point out that regardless of what is on the board, the tip of the triangle needs to be at a point that counterbalances both the weight of the board as well as the weight of the object placed on the board in order for the load to balance. Next, erase the shapes and write Plan of Salvation on the line representing the board. As students study the doctrinal mastery topic “The Plan of Salvation,” invite them to look for how this diagram relates to the plan of salvation. Invite a few students to take turns reading aloud from paragraphs 2.1 through 2.3 in the Doctrinal Mastery Core Document. Ask the class to follow along, looking for the central figure in Heavenly Father’s plan. Invite students to report what they find. Then write Jesus Christ on or below the triangle in the diagram. Invite students to locate the five subheadings in doctrinal topic 2, “The Plan of Salvation,” in the Doctrinal Mastery Core Document. Explain that these subheadings represent key elements of the plan of salvation. Write Premortal Life, the Creation, the Fall, Mortal Life, and Life after Death above the phrase “Plan of Salvation” on the diagram on the board. Explain that because the Savior is the central figure in the plan of salvation, we should be able to see Him in each of these elements of the plan. Divide students into pairs. Assign one student in each pair to silently read the paragraphs under the heading “Premortal Life” and the other student to silently read the paragraphs under the heading “The Creation.” Invite them to look for Jesus Christ’s central role in that part of the plan of salvation. After they have finished reading, ask them to discuss with each other what they found. Invite a student to read aloud the following statement from President Dallin H. Oaks of the First Presidency. Ask the class to listen for how his statement supports this doctrinal statement. “The Son, the greatest of all, was chosen by the Father to carry out the Father’s plan—to exercise the Father’s power to create worlds without number (see Moses 1:33) and to save the children of God from death by His Resurrection and from sin by His Atonement. This supernal sacrifice is truly called ‘the central act of all human history’” (Dallin H. Oaks, “The Godhead and the Plan of Salvation,” Ensign or Liahona, May 2017, 102). How does this statement support the doctrinal statement on the board? What else about the Savior’s role in the plan of salvation does President Oaks’s statement clarify? 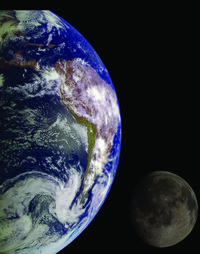 Consider displaying a picture of the earth (see the picture The Earth, available on lds.org/media-library). To help students understand the context of this passage, explain that Doctrine and Covenants 76 is the record of a vision that was given to the Prophet Joseph Smith and Sidney Rigdon in Hiram, Ohio, on February 16, 1832. This vision revealed many wonderful truths about Heavenly Father’s plan of salvation that were not known to the world at that time. Doctrine and Covenants 76:22–24 contains the Prophet Joseph Smith and Sidney Rigdon’s testimony of Jesus Christ. Invite a student to read Doctrine and Covenants 76:22–24 aloud. Ask the class to follow along, looking for what the Prophet Joseph Smith and Sidney Rigdon specifically testified about Jesus Christ. Have students report what they find. How does this passage help teach the key statement of doctrine on the board? Consider showing the video “We Lived with God” (4:00) (available on LDS.org) to help students feel the truth and importance of the key statement of doctrine on the board: Jesus Christ created the heavens and the earth under the direction of the Father. How have God’s creations helped you feel His love for you? How do you think understanding the key statement of doctrine on the board should affect our daily thoughts and behavior? Invite students to ponder what they can do to remember the role that Jesus Christ had in the creation of the heavens and the earth. If there is enough time, consider inviting students to record their thoughts in their study journals. Remind students of the diagram drawn on the board at the beginning of this lesson and that “Jesus Christ is the central figure in Heavenly Father’s plan” ( Doctrinal Mastery Core Document , 2.3). Invite students to silently read paragraphs 2.8 through 2.18 in the Doctrinal Mastery Core Document, looking for words or phrases that describe how the Savior is central to the Fall, mortal life, and life after death. After sufficient time, invite several students to share what they found. Note: The following review activity is not intended to be taught during the same class session as this lesson—“The Plan of Salvation, Part 1.” Please present this activity during a seminary class session that takes place after you have taught this lesson but before you teach “The Plan of Salvation, Part 2.” This short review can be taught at the beginning or end of a class in which you teach a regular sequential scripture lesson from the Doctrine and Covenants. Be sure that this review takes no longer than five minutes, so as not to take away from the scripture block students will be studying in class. Write the following statement of doctrine on the board: Jesus Christ created the heavens and the earth under the direction of the Father. Ask students to find the doctrinal mastery passage in the Doctrine and Covenants that teaches this doctrine. If students need help, invite them to scan doctrinal topic 2, “The Plan of Salvation,” in the Doctrinal Mastery Core Document for the scripture reference. When all of the students have located Doctrine and Covenants 76:22–24, divide them into pairs or small groups. Invite them to read this passage together and discuss with each other how it helps teach the statement of doctrine on the board. After sufficient time, invite students to share ways they can remember this reference.